The T-Ducks served up volleyball season with a win, but it was a tough fight at home against Texas College on Sept. 5. It started with Richland down by seven points. Sophmore Kyley Marberger served 4 times to bring the score up to 22-18 in the first set. Then the T-Ducks closed out the set with an astonishing win. Richland dominated as the crowd roared. In the second and third sets, players started to make small mistakes, and seemed irritated with the referees. Nevertheless, the T-Ducks rose to the occasion and won 3-0. 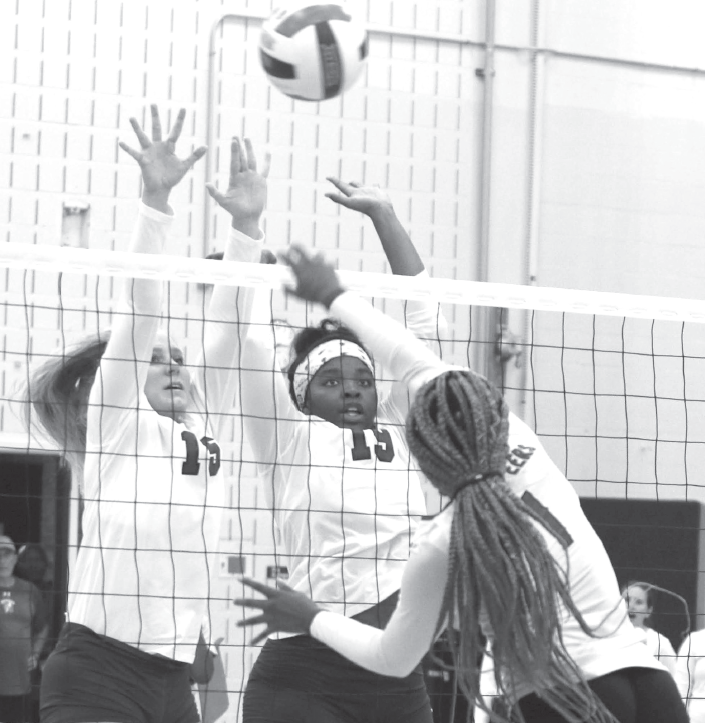 Jessica Byers left, and Dextiny Patrick block a smash from a Texas College player..
“My relationship is so good with my teammates and, as we play together, this is the most important thing because when things are wrong we can come together,” Marberger said. She is the first international recruit in the team’s history. “This is my first time at Richland. I came from Collin County [Community College] so we did recruit international students there, but usually they need scholarships and we are a Division III school so they have to be able to pay for their own schooling,” said Zelda Smith, head coach. Marberger is expected to be a breakout player for this season. As the athletic department begins to recruit outside of the U.S, it could bring about a change in Division III scholarship programs. providing more student assistance for athletes from overseas.